When word came down yesterday that Iron Man 3's Shane Black was being put in charge of the future of the Predator franchise, one word that kept being thrown around was "reboot." Included in just about every trade report, the word suggested that the franchise would be starting over from scratch and ignoring the continuity of the earlier movies. This, however, turns out to not be the case, as the filmmaker evidently has something completely different in mind. In an interview with Collider, Black has confirmed that the project he is currently working on is not a Predator reboot, but instead is being worked out to perfectly fit in with the rest of the mythology. Discussing his philosophy on the project, the writer/director said, "As far as [co-writer Fred Dekker] and I are concerned, anyway, why start over when you’ve all this rich mythology yet to mine?" Going further, the filmmaker added that what he is interested in the idea of "inventive sequels" and the "the idea of expanding and exploring the existing Predator mythology, rather than hitting the restart button." This makes plenty of sense when you consider that the Predator franchise as a whole has never really been about direct sequels anyway - meaning that a reboot would be kind of pointless. Each movie released has not only had a completely different cast and lead character - ranging from Arnold Schwarzenegger in the original, to Danny Glover in Predator 2, and Adrian Brody in Predators - but has also taken place in a completely different setting. Because of how wide-ranging the franchise has become, we can't even be sure if the next story will be set on Earth or on some foreign planet. The next movie could really do absolutely anything so long as it has the titular alien at the center of the story - and in the hands of someone as creative and awesome as Shane Black - the writer behind Lethal Weapon and The Long Kiss Goodnight and director of Kiss Kiss Bang Bang - that's a great thing. 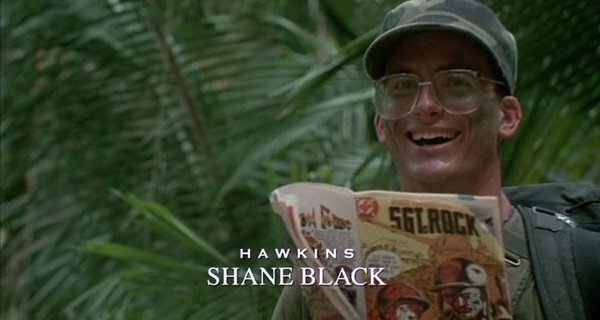 And did I mention that the director was actually in the first Predator movie back in 1987? How could you not trust this guy with the future of the franchise? While there's obviously a lot of excitement stirring up about this new Predator movie, we really don't know what the timetable for the project is. Given the series' serious name recognition, it wouldn't be surprising in the slightest if Fox was trying to have the new film in theaters tomorrow, but Shane Black also has a number of other irons in the fire. We'll have a much clearer idea of what's going on when the studio announces an official release date, so stay tuned for news on that front and more in the coming weeks and months.